Australia’s future as a nuclear waste colony Is the (now Gillard) Labor government taking Australia down the same radioactive waste path as Howard’s Liberal government was? However, Labor’s new NATIONAL RADIOACTIVE WASTE MANAGEMENT BILL 2010 forms even more sweeping legislation than the previous government’s which was designed to allow for importing of radioactive wastes. On June 2, 2007 the Liberal Party Federal Council voted to support the development of a “Global Nuclear Waste Dump” in Australia…..
Amendment Bill 2006 and the Australian Nuclear Science and Technology Organisation Amendment Bill 2006 were passed. “At the heart of the package was legislation enabling Australia to take nuclear waste from overseas that it hadn’t generated itself,” says Milne. And then there’s the money trail. 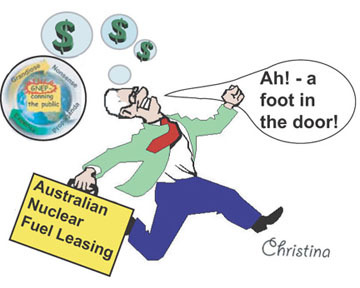 Along with his colleagues, the chairman of Howard’s Uranium Industry Framework and head of the Australian waste company Global Renewables, Dr John White has spent $45 million creating the Australian Nuclear Fuel Leasing (ANFL) company. ….Under the concept described in this submission, the Australian Government would facilitate the return to Australia of spent fuel derived from Australian uranium…. the government pushed a deeply flawed Bill through the Senate that allows the Commonwealth to impose nuclear waste on unwilling communities in the Northern Territory. The government’s controversial Bill locks in the Muckaty site that is being contested in the Federal Court. The Australian Greens oppose this approach which fails to deliver the government’s election promise and even fails to uphold the ALP’s own policy. Through such a Commission, Australia could responsibly deal with the 4020 m 3 of so-called low-level and short-lived intermediate radioactive waste and the approximately 600 m 3 of long lived waste in this country. Through such a Commission, Australia could responsibility deal with the 32 cubic metres of spent research reactor fuel that is returning to Australia from reprocessing in France and the UK in 2015-16.
o recommendations on how we can provide ongoing scrutiny of the implementation of the decisions arrived at through a proper independent process. Independence will mean that the Commission’s findings will enjoy authority and confidence, the best ingredients for social license. The Commission we outline is made up of 5 people, appointed by the Governor General on a full time basis for 15 months. After 15 months the Commission must deliver an initial report to the Minister. 15 months is a reasonable period of time to do this properly and is less time than the government took to even begin appealing Howard’s laws. By not going about this properly, the government has wasted time. By ignoring the IAEA, the UK government, the OECD Nuclear Energy Agency, the government has wasted time. – The OECD Nuclear Energy Agency recognises that, “the public, and especially the local public, are not willing to commit irreversibly to technical choices on which they have insufficient understanding and control”. The UK Committee sets out a very detailed set of recommendations on how to proceed with the siting of a radioactive waste facility. Recommendation 11: Willingness to participate should be supported by the provision of community packages that are designed both to facilitate participation in the short term and to ensure that a radioactive waste facility is acceptable to the host community in the long term. Participation should be based on the expectation that the well-being of the community will be enhanced. Recommendation 12: Experience from the UK and abroad clearly demonstrates the failure of earlier ‘top down’ mechanisms (often referred to as Decide-Announce-Defend) to implement long-term waste management facilities. It is generally considered that a voluntary process is essential to ensure equity, efficiency and the likelihood of successfully completing the process. There is a growing recognition that it is not ethically acceptable for a society to impose a radioactive waste facility on an unwilling community. From the citations above, it is clearly difficult to miss the emphasis placed by the IAEA, by the OECD Nuclear Energy Agency, International Commission on Radiological Protection, EU, the UK and the Japanese on winning public confidence and obtaining social licence and community consent for the siting of radioactive waste facilities. Australia is either a member of these institutions and treaties, or we have strong relationships with these countries considered to be like-minded on many fronts, which it makes it all the more regrettable that Australia is lagging behind on this aspect of international best practice. Australia needs to learn from other countries on principles on transparency, community participation, and stakeholder involvement in the decision making around nuclear waste. Our government, our agencies, are not fully appraised or invested in international best practice. The Commission as proposed by the Greens would finally bring Australia into the realm of international best practice. IAEA, The Joint Convention on the Safety of Spent Fuel Management and on the Safety of Radioactive Waste Management – Summary Report First Review Meeting of the Contracting Parties Joint Convention on the Safety of Spent Fuel Management and on the Safety of Radioactive Waste Management 24 December 1997. Australia’s present as a radioactive waste country Nuclear Waste : The Unsolvable Problem “…..Australia has wastelands of its own, a legacy of mining uranium in the past. They are a portent of what could happen at Ranger and Roxby Downs after mining ceases. Uranium ore mined at Radium Hill in South Australia was once processed into yellowcake at Port Pirie situated on the Spencers Gulf. The radioactive tailings from the operation were left to be washed away by high tides and eroded by high winds. At Mary Kathleen in Queensland tailings, which were poorly rehabilitated with a crushed rock cover, now seep radioactive waste into underground waters.In the Northern Territory monsoonal rains breached tailings dams of abandoned mines at Northern Hercules and Rum Jungle poisoning long stretches of the rivers below them. Ranger mine is situated in the Kakadu National Park listed as a World Heritage. Australia is committed to protect the park’s natural wonders. The mine’s tailings dam, situated in the path of monsoonal floods that pour down into the park’s unique wetlands, symbolises Australia’s failure to live up to its commitment to protect this natural heritage……………. Each wet season monsoonal downpours flood the mine; the run-off carries radioactive pollutants. The water from the around the mine, called a ‘restricted release zone’, is directed into retention ponds where it is meant to evaporate during hot summer months. However ERA failed to design the ponds to cope with the rains deposited in unusually wet seasons. The company has lobbied persistently to be allowed to release this contaminated water into nearby Magela creek. The pollutants are being carried into the wetlands where they concentrate in the silt over the dry season. At Roxby mine the tailings dam could one day be the highest landform in the area. Here too evaporation was supposed to remove all the water from the dam. However, water has seeped through underlying porous limestone formations to contaminate the ground waters. Australia’s effort to address climate change must put a stop to uranium mining. It is part of this global pretense that nuclear power is a solution. The use of fossil fuels and associated climate change impact will be immense. 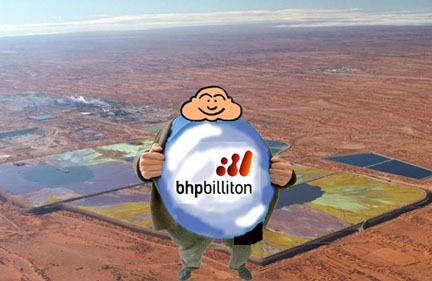 While BHP Billiton claims the expansion will account for a not inconsiderable 9.8 per cent of South Australia’s CO2 emissions within just 11 years, the real figures may be closer to 14 per cent. On-site diesel fuel usage will increase from the current 25 megalitres per annum to reach 454,000 kilolitres after 40 years (the mixed measurements are BHPB’s choice). Over the same time period, diesel for transporting material into and out of the site will increase from 16,000 to 36,500 kilolitres. The Environmental Impact Statement, (EIS) suggests potential conversion of haul trucks to run on LNG, resulting in the on-site construction of an LNG conversion facility. With peak oil impacts occurring early on in the expansion, the LNG conversion facility will no doubt need to be fast-tracked. LNG conversion of itself is a process which increase greenhouse gas emissions, yet it does not appear to be included in the climate change calculations. BHP Billiton will source its electricity needs in the first instance from the current national electricity grid, which will result in the increased use of coal-fired electricity. The closest generators at Port Augusta produce power from relatively inefficient and polluting Leigh Creek coal, with associated greenhouse gas emissions (including the release of methane). At least one of the power-stations is half a century old and should have been decommissioned years ago. Prodigious amounts of energy will be used in construction. For instance, to allow for the very large equipment that will be moved in, passing bays 30m wide and 250m long will be built between Port Augusta and Olympic Dam at roughly 17km intervals. This and other off-site construction will increase the use of fossil fuels and further blow out South Australia’s climate change targets, yet does not appear to be taken into account in the EIS.